Whether you need transmission repair, tires, brake service, a basic oil change - or any automobile repair in between - Ryan's Auto Repair is ready and waiting for your call. Conveniently located near Buckingham, Newtown, Richboro, Wrightstown, Wycombe and other surrounding areas our repair facility is modern, clean and comfortable. We use the latest diagnostic equipment to guarantee that your automotive service is diagnosed and completed right the first time. We understand how busy life can be, so we will keep track of your preventative maintenance and send you reminders to have your oil changed, your brakes serviced, your air conditioner inspected - and all the other automobile maintenance services that will keep your car running in top shape. Our technicians are more than mechanics - they are highly trained, certified professionals that will provide a written estimate, a full explanation of the services provided, and the best warranty in the business. We are focused on building customers for life. Why Ryan's Auto Repair in Newtown PA? At Ryan's Auto Repair, we are experienced in all major and minor services for your vehicle. We take pride in our work ad our reputation. 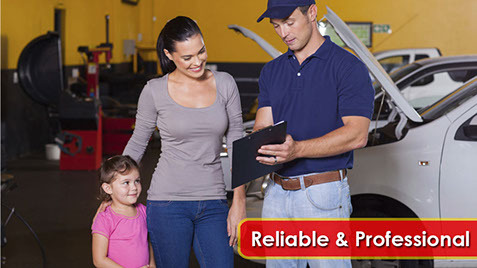 We work hard to offer you the best auto repair service in Newtown PA and surrounding areas. We ensure that we give you the highest quality service at the most competitive and affordable rates in the area! Do not take our word for it, check out our 5 star reviews throughout the web, especially those on Google. Our happy customers have been coming back to us for years because of the relationships we build with our customers. Call us Today to schedule an appointment. No matter what the repair We have you covered!